Champaign, IL – May 10, 2017 – The National Center for Supercomputing Applications (NCSA) at the University of Illinois at Urbana-Champaign released a study Wednesday detailing the current and projected economic impact of its Blue Waters project on Illinois’ economy. The project manages the nation’s most powerful sustained-performance supercomputer for open-science and its related workforce development and education program. 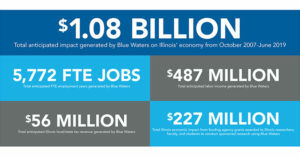 The study finds that the Blue Waters project—which is a joint investment between the State of Illinois, the University of Illinois, the National Science Foundation (NSF), and related activities funded by the university, NSF and other federal agencies—has a projected $1.08 billion direct economic impact on Illinois’ economy and will have created 5,772 full-time equivalent employment over the project’s lifespan (October 2007 – June 2019). Conducted by Dr. Sandy Dall’erba, Director of the Regional Economics Applications Laboratory and Associate Professor of Agricultural and Consumer Economics (ACES) at the University of Illinois at Urbana-Champaign, the study calculated in 2015 values the project’s impact on the creation of economic output (production), employment (Full Time Equivalent, FTE), labor income, local and state tax revenues, and federal tax revenues. The $1.08 billion in economic impact includes $487,143,813 in labor income from 5,772 FTEs, $56,477,093 in state and local taxes, $122,813,903 in federal taxes, and a $227,300,00 impact resulting from research grants awarded from granting agencies to Illinois researchers, faculty, and students because they had access to conduct research on Blue Waters. The study does not include additional economic and societal benefits coming from the significant amount of computer time provided to Illinois researchers, strategic projects, and industry, nor does it account for the workforce development activities of the Blue Waters project—as they are a magnet for recruiting expert talent to Illinois—or the impacts of the science, engineering and research results that can only be accomplished on the Blue Waters. Another way to express these results is through a multiplier, a measure of the “bang for the buck.” Over the project’s lifespan (October 2007 – June 2019), Blue Waters’ output multiplier is 1.864 (every $1 spent for BW-related activities leads to an additional $0.864 of production in the state economy) and its employment multiplier is 2.044 (every job created by BW-related activities leads to one additional job created in the state economy). Illinois was awarded the $360 million Blue Waters project through an NSF Request for Proposal process in 2007. The construction of the National Petascale Computing Facility (NPCF), a state-of-the-art computing and data center housing the system, was made possible by investments of $60 million by the State of Illinois and $87 million by the University of Illinois’ Urbana campus. The construction of the NPCF alone (July 2008-June 2012) generated about $131.7 million in total impact on Illinois’ economy, which includes the creation of 701 direct and indirect jobs, ranging from construction, to technical, to administration. The construction generated $4.3 million in local and state taxes and $9.6 million in federal taxes. The Blue Waters project, which has just completed its fourth full year of full service operations, is a key resource for recruiting and retaining world-class researchers and academic professionals. Since the project went online in April of 2013 until the study began in June 2016, it has supported 1,892 direct and indirect jobs and $177.9 million in labor income throughout the State of Illinois. The presence of Blue Waters during this period created a total of $20.9 million in local and state taxes and $41.8 million in federal taxes. The full operation and maintenance has generated a total impact of nearly $380.4 million, $227.3 million of which is due to research grants awarded to faculty with Blue Waters computing allocations. The resulting overall direct economic impact sums to $1.08B for Illinois along with all the other benefits to the state, the university and nation the Blue Waters project brings. “I applaud NCSA for its successfully stewardship of Illinois’ financial support that has enabled this best-in-class education program and resources for Illinois students and researchers,” said Rep. Kelly Burke (D-36), chair of the Illinois House of Representatives Higher Education Appropriations Committee. The report’s executive summary, including methodology, is publicly available for download. The Blue Waters petascale supercomputer is one of the most powerful supercomputers in the world, and is the fastest supercomputer on a university campus. Blue Waters uses hundreds of thousands of computational cores to achieve peak performance of more than 13 quadrillion calculations per second. Blue Waters has more memory and faster data storage than any other open system in the world. Scientists and engineers across the country use the computing and data power of Blue Waters to tackle a wide range of challenges. Recent advances that were not possible without these resources include computationally designing the first set of antibody prototypes to detect the Ebola virus, simulating the HIV capsid, visualizing the formation of the first galaxies and exploding stars, and understanding how the layout of a city can impact supercell thunderstorms. The Blue Waters sustained-petascale computing project which is supported by the National Science Foundation (awards OCI-0725070 and ACI-1238993) and the state of Illinois. Blue Waters is a joint effort of the University of Illinois at Urbana-Champaign and its National Center for Supercomputing Applications.